As yet another EU-Russia summit approaches, the topics under discussion are reduced once again to the same old subjects, on which little, if any, progress is being made. However, there is no consensus in Russia as to what the prospects are for a visa deal. In late October, Foreign Minister Sergei Lavrov expressed hope that a joint list of steps progressing towards a visa-free regime would be approved at the December summit, followed in a few months by direct negotiations to resolve the question. Ordinary citizens do not share the minister’s optimism. “They can wrap fish in their road maps,” said Polina Kiseleva, referring to the agreement to create four “common spaces:” economic, national security and justice, external security, science and education. Polina’s father, an ardent fan of the Russian biathlon team, wanted to travel to Sweden in late November to watch the team compete in a major international event. His loving daughter has twice made the 500 mile round trip from their hometown of Nizhny Novgorod to Moscow to deliver visa documents to the Swedish Embassy, and her skepticism is understandable. “They don’t respect us,” Polina said. Some Russian observers attribute Europe’s slow pace to reluctance to put Russia in a more privileged position than Georgia, Ukraine and Moldova, all potential EU members. Another possible motive is that any breakthrough or positive decision by the EU in its relations with Russia could be construed as an endorsement of the Kremlin’s overall policy course. “The European Union’s main strategic concern is Russia’s domestic policy on the one hand, and Moscow’s desire in one form or another to reintegrated the former Soviet space,” said Nikolai Kaveshnikov, an expert on European integration at the Russian Academy of Sciences. That said, experts don’t rule out Brussels or individual members of the EU making certain economic demands. Russian experts believe that the Kremlin will also not consent to show leniency in this area. There are still unresolved economic issues in Moscow-Brussels relations, despite the successful conclusion of negotiations on Russia’s entry to the WTO. And these questions are raised not only by politicians and big business. Many in Russian manufacturing and agriculture have voiced serious concerns that these sectors would take a hit from the country’s new economic status. They fear being unable to withstand competition from foreign manufacturers and farmers, especially European ones. And the Partnership for Modernization between Russia and the EU, if it ever comes into force, won’t help, according to some skeptics. Russian farmers were pleased with the recent ban on the import of European vegetables, seeing it as a protectionist measure by the state, and were upset when the ban was lifted. “Why get tomatoes and cucumbers from Holland? I can feed them to half of Russia,” said Nikolai, a landowner from the southern region of Stavropol, a southern region in European Russia. But he was silent when asked about underdeveloped infrastructure and the high prices that vegetables go for in big cities. Even after WTO entry, Russian imports of vegetables are going to be dwarfed by its exports of oil and gas to Europe. No matter how many good things have been said about energy cooperation between Russia and Europe, the parties’ interests still remain different. Diversification of energy in the EU is a concern not only to the major Russian oil and gas business, but also to millions of people whose welfare depends on its income. No matter which political party they support, political pundits say that the majority of Russians plan to vote “for a strong Russia” in the State Duma elections on Dec. 4. Therefore, all the parties vying for seats in the parliament are promising in one form or another to make the country stronger. 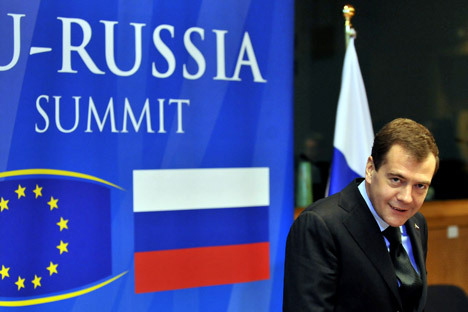 In light of these promises, it seems unlikely that Russia will make concessions to the EU.